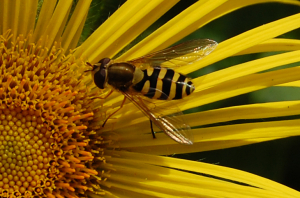 Observation - Hoverfly - UK and Ireland. Description: We think it is a female Syrphus ribesii. Top of hind leg appears to be all yellow. We think it is a female Syrphus ribesii. Top of hind leg appears to be all yellow.